At this year’s Annual Council meeting on Thursday 10 May 2018 Hayle Town Council was delighted to honour and thank Lesley Channell for her 20 years’ dedicated service to the town. She had recently retired from her work at the Hayle Day Care Centre, in which the meeting was being held. 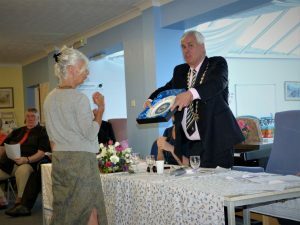 Mrs Channell said that she was honoured and proud to have been awarded the town plate, which would take pride of place in her home. She added that the Day Care Centre was a marvellous place and the community of Hayle was very special and wonderful. She had enjoyed relationships with so many of the people in the room and added that it was very odd to come to the centre not being the manager. She was immensely proud of the centre and grateful to and for everyone that had supported her. The town council wishes her all the best in her retirement.